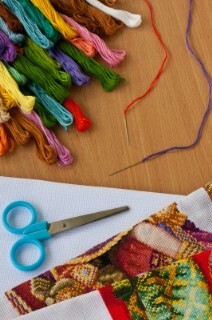 It's possible to combine hobbies and create quilting embroidery, either by hand or with an embroidery sewing machine. Recent times have brought a revival of the embroidery trend, together with the increased interest in quilting and knitting, and in general for handicrafts. Since there is not much time nowadays to spend in the pursuit of one's hobby, craft lovers are often torn between doing embroidery and doing quilting. However, they must know that it is possible to combine the two because quilting and embroidery complement each other. As a matter of fact, craft lovers who enjoy quilting but also love the colorful vibe of embroidery can combine the two arts without having the feel they are neglecting one in pursuit of the other to create quilting embroidery. A quilting creation which is also embroidered is enchanting and represents a pleasure to the eye and a delightful realization. For instance, consider the 'crazy quilts' that were produced during the Victorian era. This type of quilting embroidery work used the remaining silk from men's ties or other remaining pieces of fabric. They were pieced and sewn together randomly, so that the result was called crazy quilts. The quilt creation was then embellished with decorations in a striking way. While some may enjoy more the traditional types of quilting, you could take a glance and study these examples of crazy quilting to learn of the technique behind it and enrich your quilting knowledge. Even though the crazy quilts were heavily adorned with embroidery stitches, almost part of the quilt being covering by embellishments, the technique can still be studied in detail because it often gives hints on the small details applied, the depth and the texture of the work. The art of embroidery is relatively easy to learn for an intermediate quilt creator. Some common techniques include using feather, lazy daisy, cross stitches or herringbones for decorations and blanket or chain stitching for the outline of the fabric. A growing number of quilters like doing appliqué in their patchwork and it is easy to understand that embroidery doesn't fare too far from the appliqué. What this process involves in the positioning of several layers together and not already sewing the fabric. Embroidery stitches can be used in order to decorate the margins of the appliqué. Another common technique would be to apply embroidery to a secondary fabric to better put in evidence the primary piece of fabric. As with all technologies these days, the quilting embroidery craft lover needs to stay up to date, and nowadays floss can be used inside different fibers, like in silk, linen, rayon , hemp or Perle cotton. The floss fibers offer an astonishing area of chromatic display, coming in different models from the variegated types of floss to the hand-dyed types. Regarding the working techniques, some quilters do their work manually while other may want to work with a machine to do the quilting work and also apply the embroidery by machine. Bear in mind that various sewing machines exist of the market, all coming with a variety of options and comprehensive lists of stitches, applicable on the material without too much hassle. Be careful when you make your decision because you can feel at a loss between so many options available and when it comes to choosing threads, stitches and flosses you may simply not know what to choose. To conclude with, you should consider adding embroidery to quilting because it offers such exciting views and represents a wonderful world.